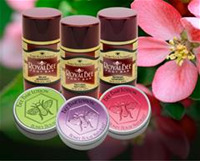 Experience rejuvenated healthy skin with Honey House Naturals products. Thoughtfully created with Organic and All-Natural ingredientsm, our superior skin care products are combined with artfully designed packaging are ideal for gifts and personal use. The original Bee Bar Lotion was formulated for a man. It is about time we make a Bee Bar with men as the focus. 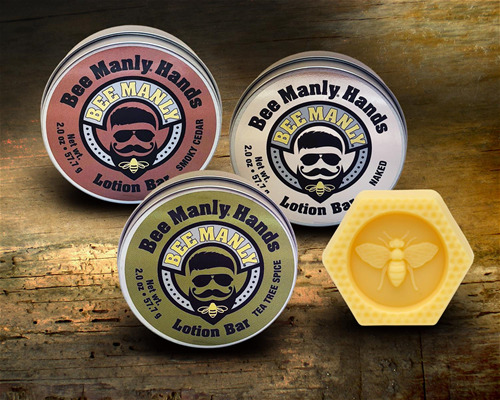 NEW Bee Manly Hands Lotion in Smoky Cedar, Tea Tree Spice and Naked. "Because Lift is Rough Your Hands Don't have to BEE. The Bee Bar solid lotion bar contains a unique blend of natural oils and emollients to moisturize and relieve dry skin.Especially effective for seriously dry, cracked heels and chapped hands, the Bee Bar is a favorite among customers. Royal Bee Foot Bar is made with foot care in mind and is in an easy to use twist up tube applicator. Using Shea Butter, Beeswax, Organic Coconut Oil, Organic Palm Wax, and Organic Argan Oil, this lotion glide on to soothe dry, cracked, tired feet.